This post was inspired by a great series of essays about, broadly, the self on Facebook by Nathan Jurgenson, Rob Horning, and Whitney Erin Boesel. They’ve given more careful thought to these issues and you really should read their essays if you are interested in identity and ‘the web.’ Here I’ll just say a little bit about why I quit Facebook and how I think quitting was related to the performance of self and social time. I was on Facebook for about 4 years, and I was a very active user. I know people who are reluctant to make status updates or share things, but I wasn’t one of those people. I made a large number of mostly inane status updates. I’d sit and wait for new status updates like an addict. For a long time it was a lot of fun. I didn’t play a lot of the games; for me creating and reading status updates was the fun. Like a lot of people, I didn’t like how often I was hitting refresh, but I didn’t quit Facebook because it was taking up too much of my day. When we first moved to Syracuse in 2005, the roar of the F-16s stationed at Hancock Field Air National Guard Base as part of the 174th Attack Wing were a regular part of the background noise. I would watch them fly over and mostly marvel at the impressive sound and speed, sometimes reminiscing of childhood trips to the EAA fly-in in Oshkosh with my dad and brothers. It’s easy to forget that these are machines of war if you focus on the awe inspiring physical experience of sound or the incredible technological achievement of human flight. Today, Hancock is home to the MQ-9 Reaper. Quieter and smaller, the technology of these remote controlled aircraft is significantly more impressive than that of the outdated F-16. For all but the sentimental, football is America’s pastime. America’s brutal, product-peddling, time-sucking pastime. I used to like football much more than I do now, and I can list a number of reasons why I don’t enjoy the game as much as I did even a few years ago. More than anything else, I simply can’t sit there for three hours watching a game. It’s not because I always use the time to do other, more productive things. It’s mostly because the typical football game seems to be a boredom inducing stretch of commercials, penalties and ‘instant-replay reviews.’ Nearly every exciting moment of a contemporary college or pro-football game is immediately followed by 2 minutes of wondering if the play will stand. Even if the play is allowed, the Weberian rationalization of the game kills so much of its potential spontaneous fun that you wonder why anybody cheers for anything until they’ve been told by the appropriate authority that it’s time to do so. Also, anyone who has watched even the slightest bit of a televised game knows that you spend more time enduring commercials than enjoying game play; the same beer and car commercials over and over again. A Wall Street Journal study showed that a typical game broadcast carries 11 minutes of action. This isn’t only a problem for those watching on television either, as anyone who has attended a game and stood in silence with 80,000 others waiting for the TV-timeout to end can tell you. The Durkheimian effervescence of shared experience is quite thoroughly dampened in these moments as you sit there noticing that you are cold and ready to go home. Last week I played dodge ball on a faculty team as part of a fundraiser. I played one game, and I was sweaty and winded. I knew it was time to stop fooling myself about walks around my neighborhood and Disc Golf being reasonable replacements for regular trips to the gym. 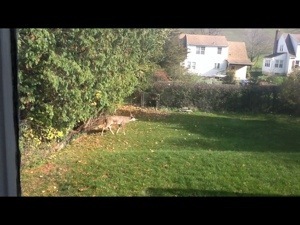 For a few hours this afternoon, a doe and a 5 point buck chose to wander in and around our backyard. I watched intently from my kitchen window. These are not the first deer we’ve seen in our yard, and I know it’s not that uncommon around here. Nonetheless, it continues to amaze me each time they appear. I can’t eloquently explain why, but it has something to do with the ‘wild’ being so close to my everyday life, but so rarely affecting my daily routines. My first thought upon seeing the ‘5 point buck’ was about how anyone could ever hunt these for sport. I’ve heard the population control arguments; I know there are diseases that can harm us and healthy deer populations, so I’m not going to make an anti-hunting argument. What I can’t understand is how, in that moment the arrow is released or the trigger pulled, you are comfortable with ending a life that is no direct threat. It seems to me that the ‘thrill of the kill’ goes much farther in explaining the phenomenology of hunting than do arguments about population ecology. The sense of community and craft that one feels when bonding with fellow hunters is likely important too.